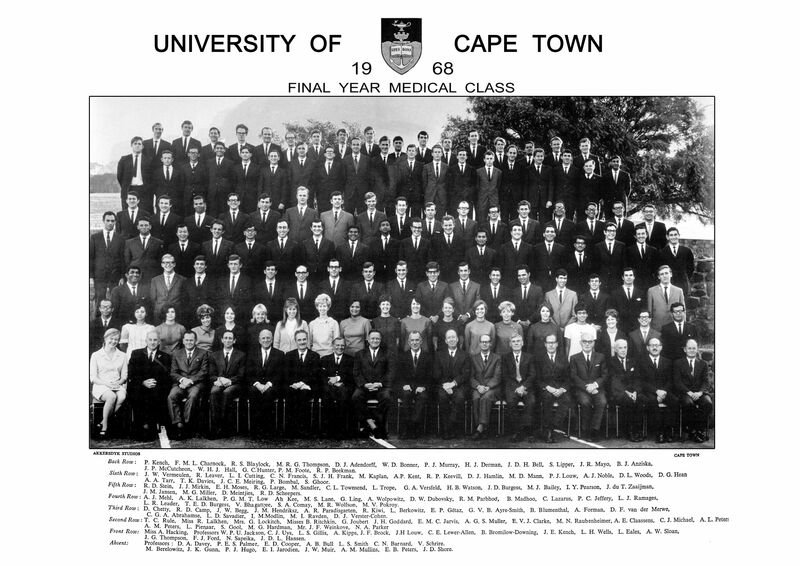 The 50th reunion of the MBChB class of 1968 was held in December and as in previous years, it was planned to coincide with the University’s Golden Graduation ceremony. This is a ceremony for all UCT graduates of 50 years ago, established to celebrate this milestone with alumni. The Golden Graduation was extra special as it also included the installation of Vice-Chancellor Professor Mamokgethi Phakeng. Fifty years ago, we climbed Jammie steps and entered the Hall to the strains of Gadeamus Igitur to receive our MB ChB Degrees. Fifty years later a much smaller group of us entered the same but newly re-named hall to the drumbeats of African drummers - we were marching to a different drumbeat indeed. Our Golden Graduation was combined with the robing ceremony of the new Vice-Chancellor, Professor Mamokgethi Phakeng, performed by Chancellor, Mrs Graça Machel, during a special graduation ceremony. Young performers thrilled and moved us with performances ranging from traditional African music to Italian opera. We knew we were in a different place, a different era, when the Vice-Chancellor’s mother welcomed her daughter with a praise poem. It was a grand day, which started with a breakfast in the Bremner Building, shared with Golden Graduates of other faculties. We were addressed by Dr Russel Ally, Executive Director of the Development and Alumni Dept, who presented us with startling facts on how much the student body and especially Post-Graduate numbers have grown. The morning concluded with a sit-down lunch on campus where graduates and members of staff mingled and chatted. The previous day we had met on the medical school campus, or more correctly now: The Faculty of Health Sciences. Ten years previously, at our 40th, I felt that the medical campus was like someone who had had a bit of a face lift, a tweak here, a lift and tuck there, but still recognizable. Now she is transformed, a new lady. The old Path building with its open atrium is now roofed over and integrated with a modern extension, a research institute of Infectious Diseases and Molecular Medicine with atmospheric control and space-suit clad figures moving about labs à la Star Wars. Prof Valerie Misrahi told us about international collaboration which is putting UCT in the position of being a foremost leader in medical research in Africa and elsewhere. We also visited the Christian Barnard Cardiac Research Centre and the Pathology Learning Centre where all those specimens in bottles which we so intensively studied in Third Year are now digitized and available to scan on a cell phone. We in Cape town were worried that our numbers were too small for a successful event as only 15 of us attended. It may have been a disappointment for those who had come from afar not to see more classmates but, from the time we first met in the MAC Centre for an academic breakfast on the first morning, the gathering seemed to gain a momentum and intimacy which a much larger gathering could perhaps have lacked. 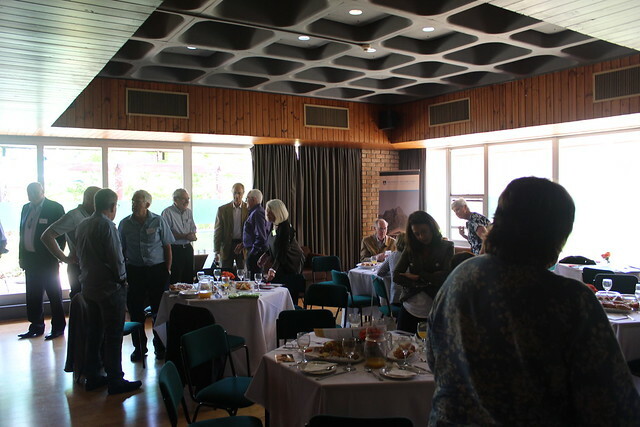 During breakfast Prof Sue Kidson came to talk to us about the future of the Faculty and an interesting Q&A session followed, with queries ranging from the excess number of female students to the recent protest action and destruction of university property. A stroke of genius was to forgo long academic presentations and allow just 5-10min to say what we had been up to for the past 50 years. Mike Wolfson, another Gynae from Atlanta, who came with Barbara, who had been in Baxter Hall with me. All these Gynaes from our class, could it have been due to the wonderful Archie Michael’s influence? It is a tribute to our teachers of 50 years ago that Class of ’68 has produced such excellence. They have had a profound influence on our lives and the way we have practiced our profession. It all came to an end with a relaxed dinner in the Harbour House Restaurant in the V&A Waterfront with promises to keep in touch and who knows, we may be doing all this again in another ten years judging by the great shape we are all in!